An outdoor kitchen is always an added value to a home property. More than that, it’s an extra living space to be enjoyed. Patio Creations designs and builds outdoor kitchens that are both stylish and functional. We can make installations tailored to your specifications. Patio Creations can build you a simple outdoor kitchen that consists of a single countertop, sink, stove and single door cabinet. Or we can install one that’s of grand proportions. It may include a fridge or freezer, dish racks, cupboards, oven, grill, and even a fireplace. Best of all, we make sure each Woodlands outdoor kitchen blends well with the natural landscape. Aside from the usual outdoor kitchen, Patio Creations also builds summer kitchens. 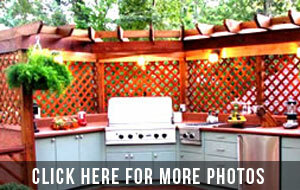 Recently, this type of outdoor kitchen has become more popular. Besides the usual components, A Woodlands summer kitchen includes a wood-fired pizza oven. It’s definitely a feature that has a lot of fun potential. Friends or family members can hang out to bake pizzas and have a pizza party. And if your home has limited outdoor space, Patio Creations can still work its magic and install an outdoor kitchen. Instead of the standard equipment, we’ll outfit your tiny backyard or apartment balcony with a portable or modular-type of outdoor kitchen. This is an all-in-one unit that has a sink, short countertop, and compact stove or oven. It’s set on casters so it’s easy to set out and store back once you’re done with it. Call us today for a no-obligation consultation. We can discuss your specifications so we can build the outdoor kitchen of your dreams.